Our Super Tangerine Glass Glitter is even more reflective. 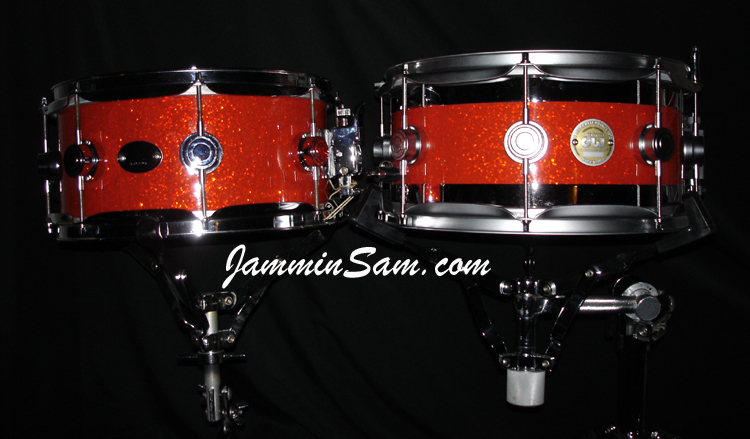 Pictures sent in (August 2006) by Keith Mikami from Portland, Oregon of his DW snares. Awesome job Keith! Just finished wrapping my DW side snare drum, and I am impressed! I took delivery of my custom ordered DW kit a few months ago. The kit is finished in “Tangerine Glass” with satin chrome hardware. The drums are all “VLT”, vertical low timbre, with birch shells. The snare has the “edge” feature, which incorporates a birch core with polished/chromed bell brass bearing edges. 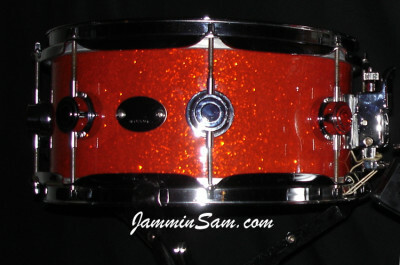 I recently found a used DW 12 x 5-1/2 snare drum that I wanted to incorporate as a side snare. Unfortunately, it was finished in a mysterious blue satin swirl that would clash with my new kit. I remembered my brother in Hawaii rewrapped his son’s kit, and said the edge/tape method was very clean and professional looking. I asked for the name of the company, and he highly recommended Jammin Sam. I got on your web site, and was surprised that you had a tangerine glass wrap available. The photo looked close, but your sales rep confirmed that it is identical to the DW wrap. The wrap process was a snap, and the results speak for themselves. I am 100% sold on your product/method, for a professional, and “factory” look/ finish. Thanks for a great product and customer support.